Having Pam and Ernie come by Sharon Johnston Park Campground was such an unexpected thrill. One of the great things about our RV life is the opportunity to rendezvous with friends as we travel. They arrived late in the afternoon and will stay for 2-3 nights. We've not seen them since we left North Fort Myers last March. Ernie and Pam at their campsite. Ernie's been getting a few warranty items done on the new motorhome. He and Pam were about 100 miles away in Red Bay, Alabama when I sent Pam a note about the kitten I'd found. While she managed to decline the kitten, she didn't decline the invitation to come to New Market for a few days. I was overjoyed! Pam and Ernie spent their first full day at New Market getting their motorhome squared away after the repairs. They are really enjoying the new coach and have discussed taking to the road full-time. Of course, Wayne and I enjoy this life and have to be careful not to oversell the idea to those who might not be ready. I bit my tongue. Our second night together we had delicious sliders Pam cooked on the grill followed by another campfire where we planned our visit to see the Space and Rocket Center in Huntsville the next day. 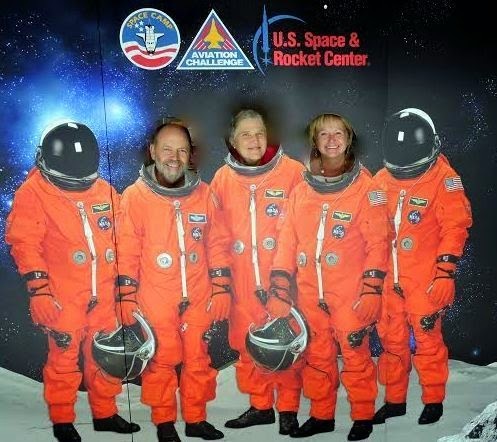 And the next day was picture perfect and we had a wonderful time exploring the huge U.S. Space & Rocket Center. We first stopped at the U.S. Space and Rocket Center Gift Shop where Ernie made an instant fashion statement. Unfortunately, his taste in style is nearly as bad as mine. While he and I both loved one particular souvenir sweat shirt, Pam explained that it's "old person" styled big buttons were just not suitable. In the end, we caved, Pam won and Ernie selected another. Ernie in the "old person" sweatshirt. Pam laughing at our lack of style savvy. The old, original section of the U.S. Space and Rocket Center was, frankly, disappointing to me. Growing up in Huntsville, I remember when the center was new and exciting and all the displays were held in the one building. I've always enjoyed visiting here and was sad to see the building in disrepair and the old displays replaced by what they call "feature" exhibits. But then we came upon the U.S. Army Apache Helicopter Flight Simulator where we stood in line for more than 15 minutes to take turns (two by two) flying and firing upon our imaginary enemy. Ernie and Wayne go first. The rear seat (Ernie) will pilot while the front seat (Wayne) is the gunner. Instructions for insuring a successful mission in the Apache took several minutes with each person. Unfortunately a computer malfunction caused Wayne and Ernie some technical difficulty and I think they would have surely been shot down by a shoulder fired rocket if they had been in actual combat. When our turn came around, Pam took the front, gunner seat while I applied my outstanding flying skill in the rear. In the photo below, Pam prepares herself for our important mission. I think we were flying in Iraq. With my instruction complete, I waved a smiling but tearful goodbye to Wayne and Ernie. My mission was about to begin. As terrible as Wayne and Ernie were at flying the Apache, Pam and I were much worse. Our guns and bombs hit nothing except perhaps a few of our own camps. Our scoreboard was embarrassing. The majestic Saturn rocket display to the left with other military hardware in the foreground. Notice the upside-down astronaut over Wayne's head on the space lab mock-up. During his military service, Wayne was part of the Nike Hercules Missile Program. It was the second generation of the Nike family of missiles. Hercules was a high-altitude surface-to-surface missile with the capability of intercepting tactical missiles and high-performance jets. They were first deployed in 1958. The photo below is of one of the Nike Hercules missiles. It is no longer in the U.S. Army's inventory. Wayne standing beside one of his Nike Hercules Missiles. The Nike Hercules had a range of eighty miles and could be made mobile. In August 1960, one of these missiles destroyed another incoming missiles at White Sands Missile Range, marking the first known intercept of a Mach-3 missile by another missile. The following month a Nike Hercules shot down another at an altitude of nineteen miles, the highest known missile kill. One of the most thrilling first-hand sights at the U.S. Space and Rocket Center, is, in my opinion, the mock up of the Space Shuttle, combined with the booster rockets here and identified as the Pathfinder Shuttle Stack. It is the only full shuttle stack in the world. This particular one was the first orbiter ever built and served as a non-flight test vehicle before being put on display. Then there's Space Shot. It offers a chance to experience 3 G's of liftoff and simulated microgravity. Not ordinarily a thrill seeker, I said I'd take the plunge if Ernie did. Of course Ernie did. I thought I was going to die. Photographs could not capture my horror of the blast-off and subsequent fall back to earth. Ernie and me. Taken just before liftoff. The newer complex to the Space Center is the Saturn V Hall where a full size Saturn V2/A4 Rocket, the grandfather of all rockets, is displayed in the gargantuan building. The Apollo 16 Capsule was launched and returned in 1972, carrying three astronauts. The parachute is attached (orange and white) here. The Moon Rock collected by astronaut Alan Bean in 1969 of Apollo 12. Ramp / Walkway for access to space capsule atop the rockets. There was much more to see, do and learn here but these are the highlights of the visit for me. One item I missed seeing was the A-12 Blackbird that, in it's day, traveling from New York to London, is just 60 minutes, was super fast. Today, it is considered an antique. Amazing stuff for space travel lovers. In the end, feeling completely educated in space rocketry, we pronounced ourselves "Astronauts". Here is our official photo taken in our uniforms. With face shields open, here's Wayne, me and Pam. Ernie wouldn't lift his shield. Pam and Ernie would stay on for an extra day at Sharon Johnston Campground, where they relaxed, took walks, fed ducks, practiced golf and visited with us for a few more precious hours. It will be winter before we'll see them again -- in south Florida.